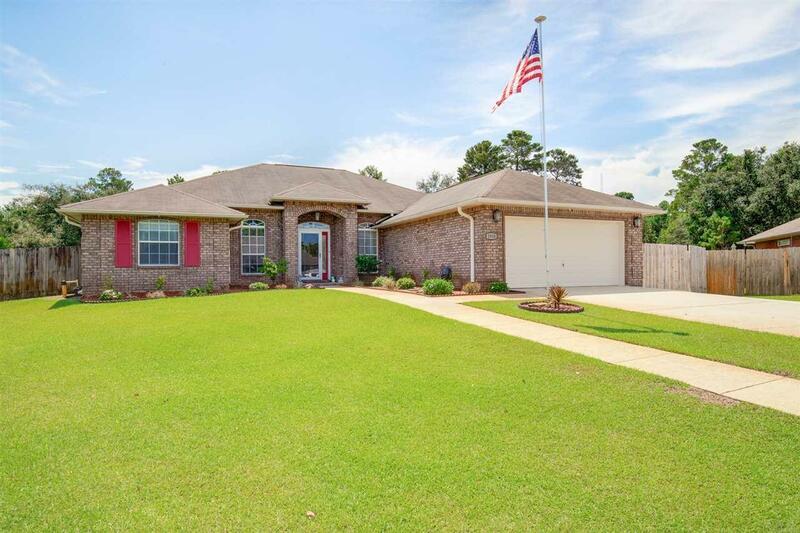 Beautiful home located in the subdivision of Melissa Oaks. Perfectly situated midway between Pensacola Beach and Navarre Beach. This 4 BR / 2 BA home offers a split floor plan with two living areas, formal dining and eat in kitchen. The 4th bedroom can be used as an office or den. Living room and dining room have 10&apos; ceilings. Kitchen opens to breakfast nook and family room which has a corner fireplace, trey ceiling, and lots of natural light. Split bedroom plan features a large master suite with trey ceiling, dual walk-in closets, garden tub, separate shower, and dual vanities. This home boasts one of the largest lots in the neighborhood, setting on almost Â½ acre. Newly landscaped with an above ground pool (installed 2016 â 5 year warranty), RV or Boat Pad and covered outdoor living space. New window and exterior doors 2016, new kitchen appliance 2016, security system and outdoor sound system. Near beaches, base, schools and bay this meticulously maintained home is a must see!